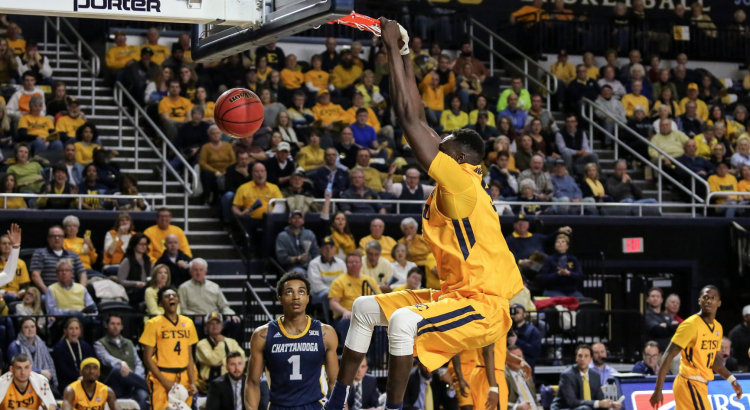 Today the red hot ETSU basketball team faced an improved Chattanooga team who knocked off 2nd place UNCG earlier in the week with hopes of doing the same to ETSU. The Bucs did not disappoint the sell out crowd at Freedom Hall as they rolled to an easy 81-61 victory over rival Chattanooga. The win is the 15th in a row for the Bucs which is tied for the 2nd longest in school history, set by the 1952-53 Bucs. Early in the first half it looked as if this would be a close game tied at 18 with about 10 minutes left in the half. From there the Bucs went on a 14-2 run to lead by 12 with two minutes in the half. The Bucs continued to run away with it in the 2nd half as Chattanooga didn’t get any closer than 11 points the rest of the game. ETSU has now won 4 straight games against rival Chattanooga with three of those four wins being by double digits. ETSU was led in scoring once again by Desonta Bradford who scored 22 points. Peter Jurkin also had big game for the Bucs, brining in a double double with 16 points and 13 rebounds. ETSU continued to dominate on the defensive end, the Bucs held the Mocs to 39 percent shooting and 26 percent (5-of-19) from 3-point range. ETSU had a 39-25 rebounding advantage and 44-32 on points in the paint. The Bucs also shot well for the 2nd straight game going 57% for the game and 56% from the 3-point line. ETSU is now 12-0 in the Socon and 21-4 overall. The Bucs get a much needed break and will not play again until Saturday, Feb. 10th on the road at VMI. The Bucs were showing Chattanooga and the rest of the Socon why they are often called “Jam City” by the Buc faithful. ETSU put on a bit of a dunk show with three amazing dunks from David Burrell, Peter Jurkin and Desonta Bradford. Below are all three dunks. In attendance at todays game against Chattanooga were the legendary Bucs from the 1967-1968 season who made the Sweet 16 after defeating Florida State in the 1968 NCAA tournament. They were celebrating the 50th anniversary of their sweet 16 appearance and were honored in the first half. The ’68 Bucs also took time to speak to the 2018 Bucs this morning during their practice.